1 What is Speed Pool? Speed Pool is a type of billiard game. This billiard game is based on speed with the goal of pocketing all 15 ball﻿﻿﻿﻿s as soon as possible. A stopwatch or a timer is used to measure how long it will take the player to pocket all balls. This time will be recorded and the winner of the game is the one with the fastest time. There is no limit as to how many players can compete against each other but only one player can play at a time. A player can play for three consecutive games, wherein the fastest time among the three games will be recorded. It is suggested that the players play alternately. 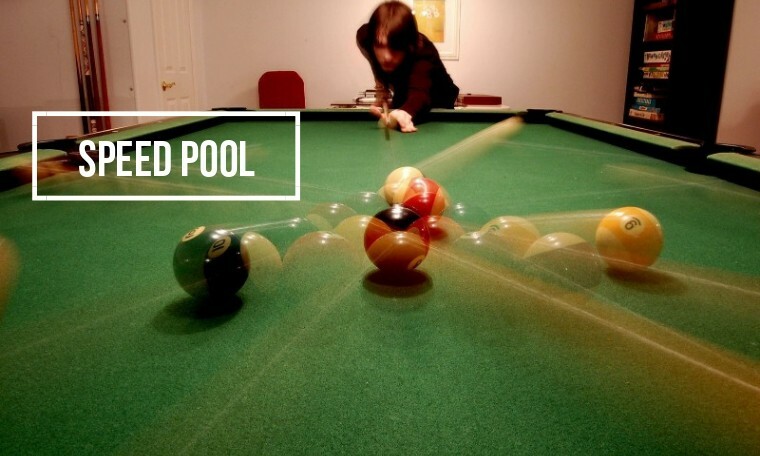 Like in a standard pool game, speed pool uses 15 regular balls and one cue ball. The positions of the balls in the rack are the same as in an 8-ball game. The “8” ball must be in the middle and there must be a head ball in the head spot while other balls can be at any random positions. First, nominate a time keeper. The time will start when the player hits the cue ball. The cue ball must come to a complete stop before the player can make another shot. Any other balls can be in motion as long as the cue ball has stopped before making the shot. Any object ball can be pocketed but the 8 ball must be the last. The player can only do legal shots. It is any shot where the cue ball makes contact to the object ball and drives it to a cushion, the cue ball hits the cushion, or the object ball is pocketed. If the cue ball is potted or comes off the table, it is returned to the “D” area. If any object ball comes off the table, it is returned to the head spot or any area nearest the line between the “D” and the head spot. The player on the table is the only one who can pick up and replace the balls as mentioned in the two previous rules. The time it takes to do this is his/her penalty. The timer will stop when the last ball (8 ball) is pocketed. In case of a tie, the concerned players will take turns until someone wins. Considering that the cue ball will still be rolling after hitting the object ball, professional players often run around the table to prepare their next shot while estimating where the cue ball will stop. This game is heavily-based on time, making the players use stop-shots and other hitting techniques in order to minimize the waiting time for the cue ball to stop. Unlike in a standard pool game, bank shots are rarely used in speed pool even though it is considered a legal shot. A bank shot takes longer time and it is better to use other legal shots if the player wants to move or nudge the object ball to a certain spot. Mistakes in shooting the balls are taken seriously to avoid time penalties.